I have been working on a front porch mood-board for a friend of mine and I thought I would share! Her house is a beautiful classic New England style home - white with black shutters - one of my favorite home looks! To keep with the classic look but add some color and fun we decided to go with black & white cabana stripes, banana leaf pillows and some great planters. She is full-of-life and a young fun mum with 2 beautiful baby girls so I want her home to be an extension of her beautiful personality! The front porch is a long narrow space; there are not many pieces of furniture that will fit so we are going to be using pieces that she already has that fit the space perfectly . . . just going to spray them black with outdoor furniture spray paint! 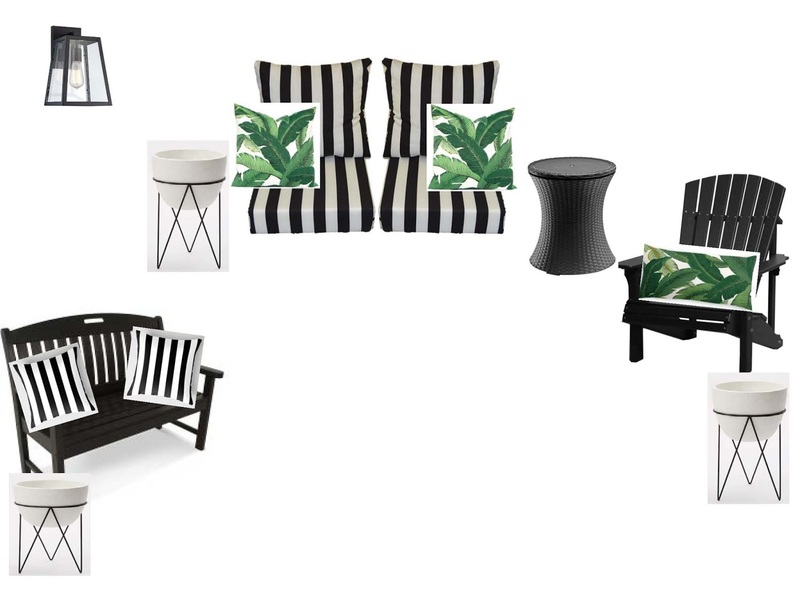 We are having pillows and seat cushions made in black & white cabana outdoor fabric and getting the banana leaf outdoor throw pillows from Etsy. This is going to look great - can't wait to show before and after photos! So excited to see the big reveal! Your taste and talent are off the chart!! !